Magnetic field, when applied to normal water, restructures the water molecules into very small water molecule clusters, each made up of six symmetrically organized molecules. This miniscule cluster is recognized by the cell as "bio-friendly" due to its hexagonal structure and because the toxins cannot travel within the cluster, and easily enters the passageways in plant and animal cell membranes. The result provides maximum, healthy hydration with less water. It’s funny how one word can have so many different meanings. For example, when “good” is used to describe water, what are all the possibilities of that meaning? It could mean sweet tasting. Or it could mean soft. To many it could mean bottled. To some, it means you can see through it. To others, it’s an acceptable color of tan. Or brown. At Omni Enviro, our starting point for “good” water means it actually enters the cellular structure of the plant or animal. Water that doesn’t hydrate, isn’t “good” water as far as we’re concerned. After all, the number one reason for illness in all living things world-wide is dehydration. Here’s the hard part to swallow: A lot of sweet tasting, soft, bottled water doesn’t hydrate very well. Even if you can see through it. That’s because many of the water molecule clusters are too large to enter the cellular structure of the plant or animal. Unfortunately, that sort of “good” water passes right by the cells. 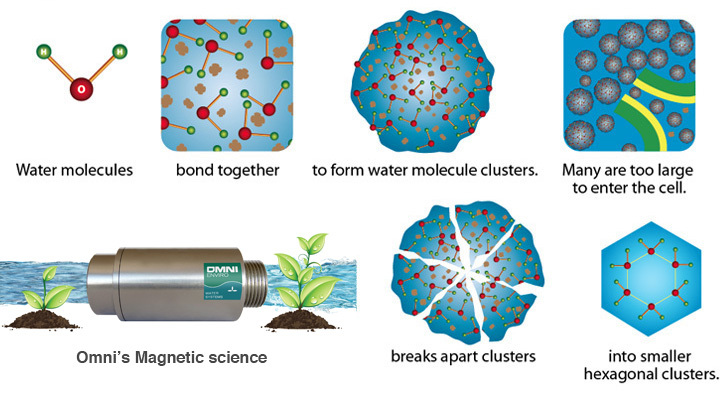 But when water is processed through the hydrodynamic magnets of the Omni system, the oversized water molecule clusters are broken down into miniscule units, with only six water molecules in each cluster. That incredibly small size is completely bioavailable to the cellular structure, able to easily enter the cells and more fully hydrate. If the idea of water being broken down into clusters of six water molecules seems foreign to you, just look at a snowflake, the basic unit of frozen water. How many legs does a snowflake have? Six. To try to give an idea of how small that is in comparison with typical, untreated water molecule clusters, it’s like comparing flour to sand. Now, back to hydration. Full hydration balances typical negative elements that might be hiding out in the cells, making them nonfactors in terms of negative influence. 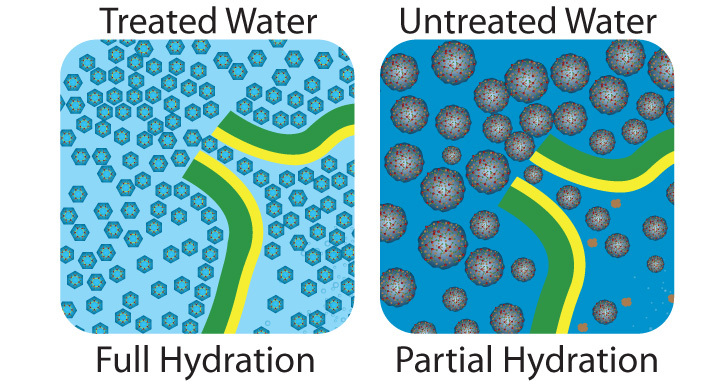 Full hydration in plants creates healthier, more robust plants that produce greater yields and require less water, since every drop of Omni water hydration is capable of entering cells. In humans, full hydration means a boost in the immune system because of the speedier, more efficient delivery of nutrients and removal of toxins from those cells. It degasses chlorine, chloramine, and fluoride, making them non-interactive with the body. For all living things, this water breaks down minerals into smaller units and holds them in suspension, so they more effectively enter the cells. Examples of animal health: Omni water reduced the mortality rate of chickens by 200-300%. It created larger litters of piglets that grew to maturity faster. Examples of plant health: Omni water increased the yield on a test plot of spinach by 35%; provided 100 more boxes of sweet corn per acre (27% increase); produced increases of broccoli by 21%, lettuce by 24%, and 606 more melons per acre. And that’s why you don’t need as much of it to do a better job. It’s why we can guarantee a minimum 10% increase in yield for a minimum of 10% less water used. But Omni water gets even better than just “good.” It won’t allow scaling—and even removes scaling. It washes salts away from the root structure of the plant. It balances pH. And much more. The benefits go on and on. The bottom line? We deliver healthier, hydrating water.